I was very inspired recently by the TV series The Great British Bake Off. What finally got me baking from it, was the short series that followed it of masterclasses. I had already purchased the book (http://www.amazon.co.uk/Great-British-Bake-Off-showstoppers/dp/1849904634) but once I had seen the very delicious Paul Hollywood produce this loaf, I simply had to have a go. It is actually not as tricky as it looks. As long as you follow the instructions, at times you think you may have gone wrong, especially at the beginning of the plait but trust Mr Hollywood, it will be fine. Put your flour into a large mixing bowl. Put the salt in on one side and the yeast on the other. Add your oil, mix together. Add 3/4 of the water and start to bring the ingredients together with your hands, then work in the rest of the water. Knead for around 10 minutes until the mixture is silky, stretchy and soft. You can absolutely use a food mixer for this. I always do. If you do use a mixer, add your water to the bowl first. This I find, makes the ingredients combine more effectively. Use the dough hook attachement and mix on the lowest speed for around 10 minutes. Once your dough is mixed pop it into an oiled bowl and cover with cling film or get some shower caps ( usually pretty cheap on eBay ) as these are so easy to just pull over the top of most mixing bowls. Leave this in a warm place for around an hour or until the mixture has doubled in size. Knock back your dough and turn it out onto a lightly floured work surface, shape it into a sausage and divide into 8 equal pieces. Then take each piece and roll into a long strand,around 40cm in length. Lay the strands out onto your work surface, much like an octopus and gather the ends together. Squish them a bit so they stick to each other and then push down so that they then stick to the surface. As they are laid out in front of you, number them 1 – 8 and then plait using the following sequence. Note that every time you move the strands, the numbers will revert to the original 1 – 8 sequence. Step 1 is only done once. Place strand 8 under strand 7 then over strand 1. Strand 8 over strand 5. Strand 7 under strand 6 and then over strand 1. 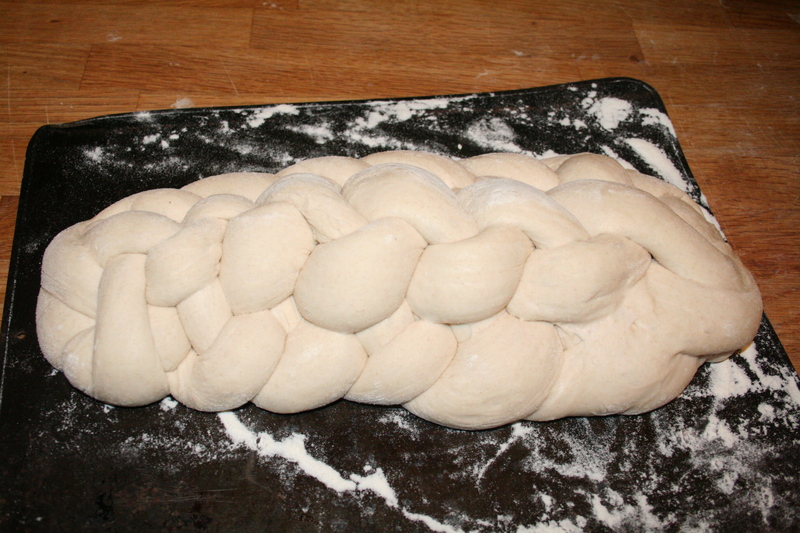 Then repeat the steps from step 2 until you have plaited your entire loaf. 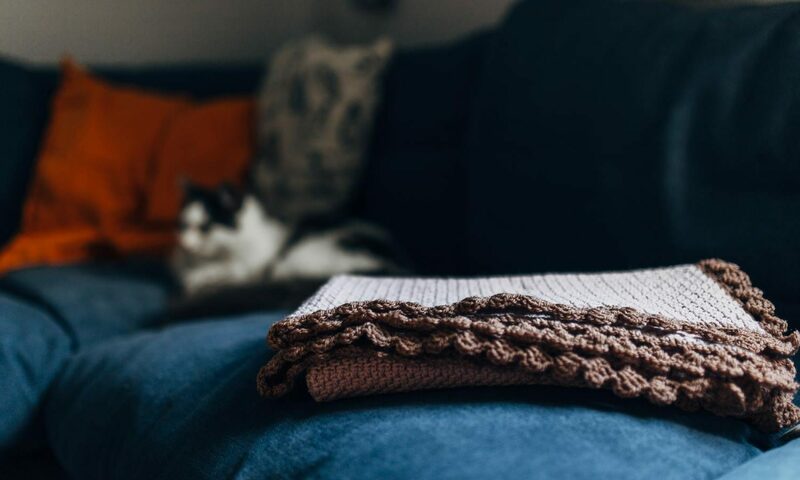 Tuck the ends under neatly. 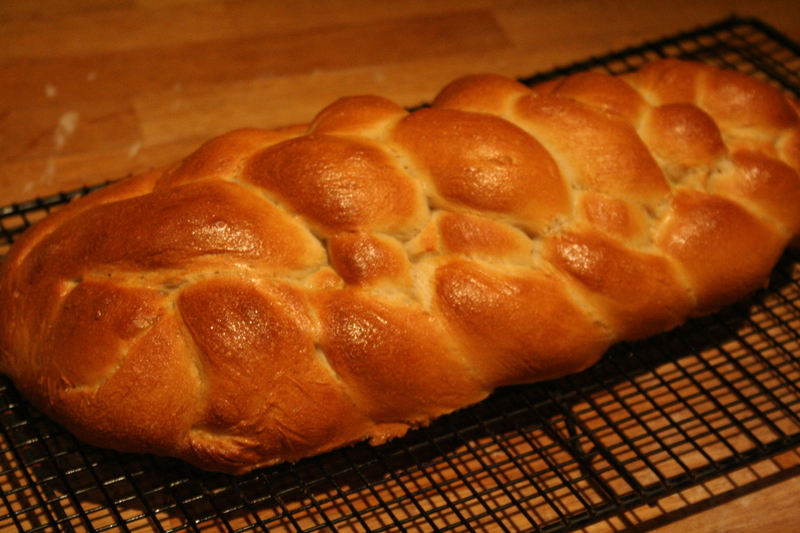 Pop your loaf onto your preprepared baking sheet and leave to prove for about an hour or doubled in size. 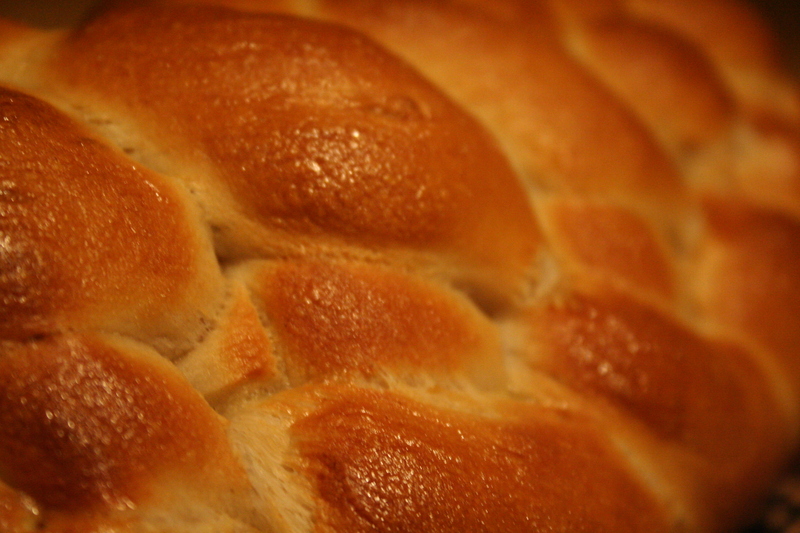 Brush your risen loaf with your beaten egg and then bake for around 20-25 minutes. The loaf will sound hollow when you tap it on its bottom when it is cooked. Try and stop the family eating this when it is just out of the oven, as it will not slice happily hot. Patience is a virtue in this case!